Office Hours: Monday through Friday, 9 a.m.-5 p.m.; Park Hours: dawn until dusk; Boardwalk Hours: dawn until 1 a.m. The Town Park is a premier community recreational facility featuring 11 acres of natural beauty including trails through the Maritime Forest and willow swamp, open green space, soundside views, and access to the Town’s Boardwalk. Park amenities include an amphitheater, public kayak/canoe launch, playground, dog-friendly water fountain, picnic shelter, Town green, and gazebo. The Duck Boardwalk can be accessed from the Park and other locations throughout the Town’s Village Commercial District. Please see the map in this section for details. 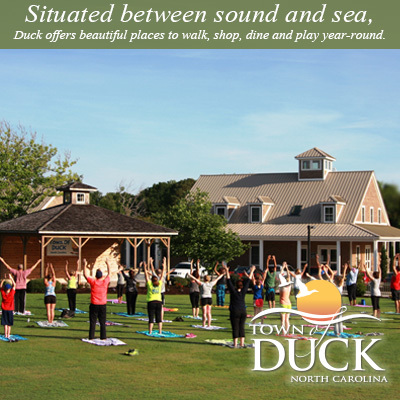 The Duck Boardwalk allows residents and visitors alike to enjoy the beauty of the Currituck Sound, visit some of our fine retail establishments and restaurants, take in a show, or just relax and enjoy the day.